View more presentations from TodoPorMisiones. The popularity of digital photography began when digital cameras became commercially available around the late 1980s to the mid 1990s. Since then, a lot of people have set their film cameras aside in favor of their digital cameras. 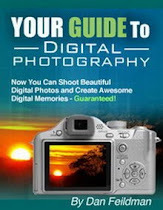 Digital photography is the act of taking photographs and saving them to a digital format. Therefore, a scanned photograph can also be considered as a digital photograph. There are several reasons why people prefer digital photographs. First of all, seeing the results of digital photographs is nearly instantaneous. After the shot is taken, the photographer can immediately see and decide if he likes the result of his shot. This method is much cheaper than film because when using film, one has to print all the photographs taken including the duds which can’t be seen until after they are processed. Another reason why people prefer digital photographs over traditional ones is that there are so many ways to share digital photographs. One can send them through email, burn them to a disc, send them via Bluetooth or print them like film photographs. Of Course, there are purists who still prefer film. They may consider film photographs as more lifelike or pleasing to the eye. However, the more advanced digital cameras of today are slowly gaining ground and beginning to produce images that impress even the purists. Also the convenience and cost saving benefits of digital photography ensures that it will continue to be a popular choice for photography enthusiasts. I love high quality black and white photography. There's something dreamlike about the images. Check out the Mountain lion in the ninth photograph! Visit The Countries of the World.